No snowflakes drift through our skies, and we’re generally denied the sharp glitter of sunlight on ice during our winter season. 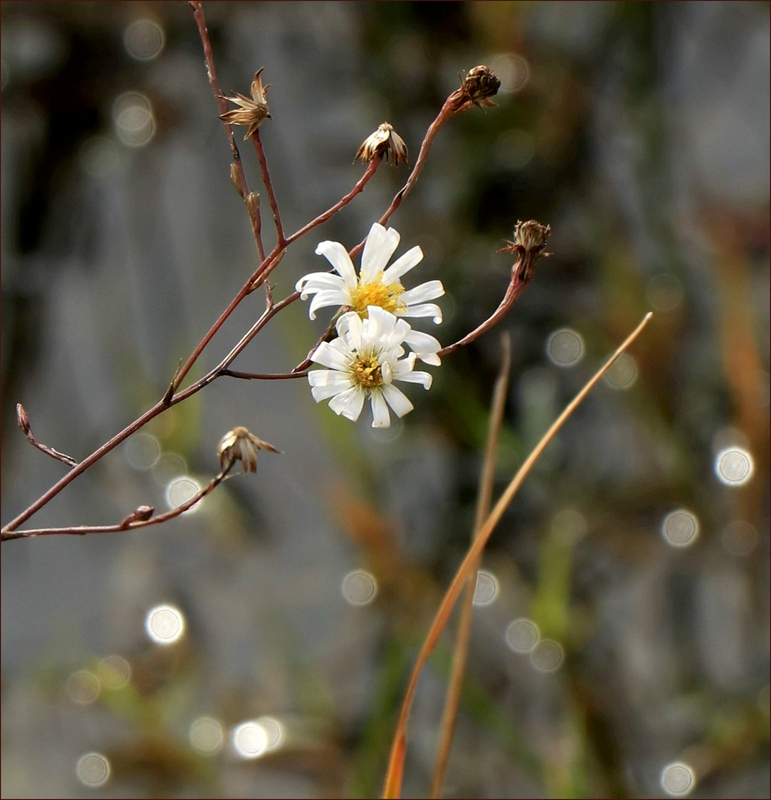 Still, the delicate, snowflake-like blooms of perennial saltmarsh aster (Symphyotrichum tenuifolium) linger late into the year, decorating the edges of ponds and sloughs. Not a choosy plant, they’ll grow wherever water collects. Here, reflections from a water-filled ditch along a Brazoria County road add elegance to a favorite winter flower. All of our asters are lovely, as well as being prolific and tough. A couple of years ago, another species decided to set up shop along a marina’s bulkhead, even growing out over the water from the cracks between the boards. I noticed a lot of Texas dandelions blooming yesterday, as well as a flower called crow poison, or false garlic. It was a reminder that we’re coming to the end of January, and it’s time to start watching for early spring flowers. What a difference latitude makes! It certainly is a very attractive plant, Linda, but I am afraid that we are a couple of months away from bloom here. As I look out right now it is snowing steadily – and I have a half hour drive to put on a presentation this afternoon. Better give it least an extra fifteen minutes! We are leaving for Costa Rica dark and early in the morning so we are hoping that the drive to the airport in Toronto won’t be too bad. I hope that drive’s as pleasant as yesterday’s walk through the Mill Race, albeit warmer. I’ll look forward to your photos from Costa Rica. I’ve taken to watching the Cornell bird cam in Panama, and have enjoyed seeing live examples of birds often photographed by a friend who lives in Ecuador,and whose art often depicts those beautiful creatures. Safe travels! It’s good you didn’t grow up faster. You’d not be here to cheer our winter. The flowers do seem part of a little galaxy, don’t they? Your verse is delightful. The line about being “a better sprinter” suggests an expanding galaxy like our own. Whether seen as snowflake or star, they are cheerful. It won’t be long until spring begins to expand. The buttercups have been joined now by crow poison and Texas dandelions, a new flush of coastal germander (Teucrium cubense), and even some gaillardia, which is either really early or (more probably) really late. It’s sleeting right now, but it’s easier to take with some flowers around. I thought so, too. For some reason, those ‘sparkles’ of light made me think of New Year’s Eve (perhaps the crystal ball that drops?) or glitter, or diamonds: all associated with celebration. Add in Steve’s image of the asters as stars, and I found myself thinking of these stars on the water. That’s a pretty good tune! I like it. It always takes me back to my times in Louisiana, which is a good thing. Glad you like it! Texas is the land of ones planted not choosily? (If we get any more rain, you’ll be able to take this picture as flowers grow along your sidewalks HAHA). Love the sharp flower focus and the background blurs dancing behind it. We had sleet bouncing – saw it if you didn’t blink twice. With luck we’ll get a break and some sun soon! I did see the sleet — at 11:25 a.m. A friend saw it in West U about 9:30, heading south. If that was Act II of our winter, it certainly didn’t last long. Let’s hope that we don’t get an extended Act III or, heaven forbid, an encore. You know I enjoyed those little lights dancing on the water — sparkle beats slog, every time. Texas and Florida get their snow and winter scenes where we can find them, like in the petals of a flower, right Linda? We sure do. People may laugh at us for wrapping palms with Christmas lights and turning hay bales into snowmen, but we do what we can. Sometimes, as this plant proves, even nature’s willing to lend a hand. I have tiny weed flowers in my lawn that look like frost when they’re in bloom!! What a pleasure that must be. All the ‘pretty’ of cold weather, without any of the downside. Somehow, this poor flower looks forlorn to me. It’s probably lonely since its fellow blooms have died off … or maybe it’s wishing for a spot of snow?!! Or maybe it’s just tired. It’s been a long summer and fall, and even plants need a little rest before it’s time to start meeting all the demands of spring. I know this — if it were longing for a bit of snow, you’d be one who could ship some down here. Stay warm! Actually, most of ours has melted, except for the places where the plows piled it up to remove it from the streets. Dallas has been walking on real grass for the past couple of days — of course, more snow is on its way, but it’s the below-zero temperatures that are worrisome now. That is a charming photo. What it lacks in snowflakes, it makes up for in quality of darling! Aren’t they sweet flowers? There’s something about the tiny ones that does charm: lily of the valley, violets, asters.I always smile when I find them. I didn’t mention in my first comment (which I should have), that I did smile when I first viewed the photo. There really is something kitty-cat and puppy-dog endearing about tiny flowers. Added to that, the sparkles, well it’s just a photo full of charm! Superb photo. All the more so for the beautifully captured bokeh in the background. Thank you, Vicki. I’ve always laughingly called the many flowers I find growing in these waterlogged ditches my ‘ditch diamonds.’ In this case, the reflected light added some ‘diamonds’ to the image, and I thought it was the perfect addition. The flowers didn’t obey our local (and obviously jocular) admonition to “keep it between the ditches,” but when they veered off the road and bloomed in the ditch, it created a great opportunity for a little fun with the camera. I wonder if anyone’s published a book called The Opportunistic Photographer? Of course we all are opportunistic, but sometimes those opportunities are more obvious. Those are cheery winter blooms! Our first daffodil bloomed 2 days ago. How wonderful for you, Lavinia. Are they on schedule, as we say? With so much cold and snow in the northern states, it’s easy to forget that we’re nearly to spring in our area, and I suspect in yours. Perhaps you’ll have some flowery treasures to share with us when the new month comes around. I love the way the petals scroll up from the tip. A touch of elegance. Isn’t that fun? Even as they begin fading away, they do it with a certain panache. They remind me of the way the tips of bird feathers can curl: also precise, and elegant. They’re proof that when it comes to the beauty of flowers, size doesn’t matter at all. I’m glad you enjoyed seeing them, Dina. These are such charming little asters, and the bokeh is really nice! I think charming is exactly the right word. I often see jewelry in flowers, and these would make a delightful pair of earrings: enamel, perhaps, with a bit of gold in the center. Anyone wearing them would sparkle like the bokeh. I’m always amazed by the differences in seasons in this very large country of ours. Even in Texas, winter’s experienced very differently in the high plains and the coastal plains. We’re lucky to be able to share those differences in real time — even if we end up envying one another a bit now and then. The flora around you is so different from any I’ve ever known (or seen probably!). It’s fun to see plants like this – yes, I can see “aster” but this is different too. Nice! The circles of light, or bokeh or whatever, in the background really enhance the flowers, too – great photo. There are so many varieties of aster that I’m often not sure which I’m looking at. This one and the so-called white heath aster are fairly easy to identify, though. I’m always tickled by this one’s willingness to keep blooming even when its feet are directly in water — a tendency that helped me with this photo. When it comes to photography, I sometimes think, “I wonder if I can do that?” Other times, I find myself thinking, “I wonder how I did that?” Both are part of the learning process. How nice to have blooms to enjoy almost year round. Our idea of winter blooms are frost and ice. But witch hazel and skunk cabbage approacheth. It’s a lovely image of the flowers and specular highlights. Thanks for adding to the things I can look forward to. I thought this had a delicacy that really is akin to the frosts that you have. It was one of those times when a cloudy day seemed to provide better light than bright sunlight would have. Gray water can sparkle just as well as blue, it seems! Witch hazel is one of those things I’ve not yet seen. I think it might be around in East Texas; I need to check that out. I thought I’d spotted some a few years ago, when I was just getting started with all this, but, no: I’d found dodder. Silly me! Dodder, hah! That’s what I have to look forward to in the not too distant future. Light overcast is my favorite light for closeups of any kind and flower portraits for the most part.. I haven’t had a professional haircut or shave in ages, but as a kid I remember witch hazel as the aftershave my barber used.